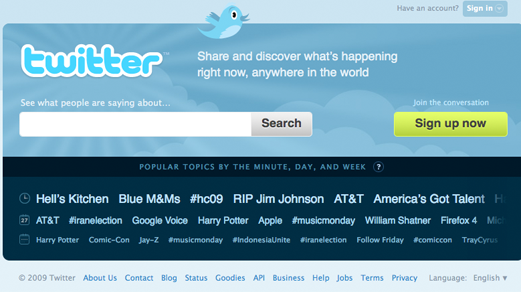 It's taken twitter three years, but at last its changed its homepage. Careers in IT have been hit badly by the recession. Employers have shed staff at unprecedented rates, companies have accelerated their plans to move IT offshore, and vacancies for job hunters have been few and far between. Come on twitter sort it out, for all our sakes, and yours! I have written a lot of blog posts about twitter and am a massive supporter of the medium as a communication tool, but it seems that twitter itself has forgotten the art of communication. This is a great blog post for all those women out there working in technology and looking for resources and blogs that are discussing their issues. Cloud computing is over head. No longer just on the horizon, exciting analysts and marketing people, but a looming presence. Congrats to Steve Gasson, a software programmer from Kent, who was crowned the winner of ComputerWeekly's F1 racing game with a winning time of 20.37 seconds. It's absolutely amazing that the computers used to guide the Apollo 11 mission to the moon were no more powerful than a pocket calculator or a mobile phone. Well it was interesting night at TechCrunch's Europas in London last night. Isn't it time that IT departments lost the command and control mentality particularly as we move to a new business paradigm that is more open to collaboration.